Being an entrepreneur in the U.S. is no easy task. Now try doing it just a few years removed from your home country and start a successful business. This is exactly what Jasmine Azima, founder of Jasmine Engineering, set out to accomplish. After coming to the United States, she attended school at the University of Texas and completed her education with a degree in mechanical engineering. By the time she was 26, she had started her own engineering firm, Jasmine Engineering. While the road has been a tough one, she still finds joy in engineering. “I always had very strong interest and abilities in science, physics, and math while I was growing up. I loved cars and anything mechanical … It was almost second nature for me to transfer those skills into pursuing engineering as a career. At the University of Texas, I decided to go into mechanical engineering because it was dynamic and the most challenging to me,” said Azima. 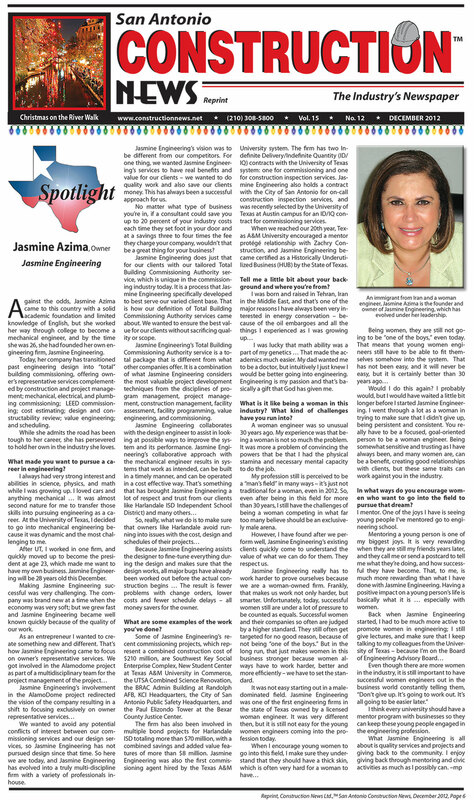 After Jasmine Engineering found its calling in Owner’s Representative services, the goal was to make the firm stand out from competitors. They do this by looking for ways to save clients’ money without sacrificing quality. In most cases Jasmine Engineering can save up to 20 percent of industry costs and three to four times the fee the firm charges, explained Azima. The firm accomplishes this thru a tailored service called Total Building Commissioning Authority. The service is a unique process that combines the most valuable project development techniques from the disciplines of program management, project management, construction management, facility assessment, facility programming, value engineering and commissioning. This approach to this service is different from any other firm. Azima believes this is the best way to approach a project and bring value to the client. The end result to this methodology is a collaborative effort that involves the owner, design engineers, architects and contractors. This communication and collegial approach ensures that all parties are in the discussions that results in systems operating as intended, built in a timely manner and operated in a cost effective way. When the firm is brought into the fold during the earlier phases of a project, the result is fewer problems with change orders, lower costs and fewer schedule delays – all money savers for the owner, says Azima. Engineering was also the first commissioning agent hired by the Texas A&M University system. The firm has two Indefinite Delivery/Indefinite Quantity (ID/IQ) contracts with the University of Texas system: one for commissioning and one for construction inspection services. Jasmine Engineering also holds a contract with the City of San Antonio for on-call construction inspection services, and was recently selected by the University of Texas at Austin campus for an ID/IQ contract for commissioning services. “Unfortunately, today, successful women still are under a lot of pressure to be counted as equals. Successful women and their companies so often are judged by a higher standard. They still often get targeted for no good reason, because of not being “one of the boys.” But in the long run, that just makes women in this business stronger because women always have to work harder, better and more efficiently – we have to set the standard,” said Azima. The bottom line is that Jasmine Engineering is all about providing quality services on projects and giving back to the community. “I enjoy giving back through mentoring and civic activities as much as I possibly can,” said Azima. To learn about Jasmine Engineering click here or contact us via email.